There was a lot of affection between Frank Sinatra and Marilyn Monroe. And it’s believed by many that at times, it was more than affection. 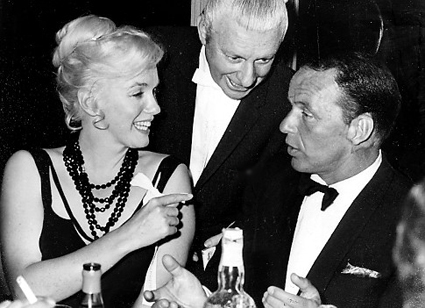 Frank and Marilyn spent time together in Los Angeles, Marilyn was present for Frank Sinatra and Rat Pack shows in Las Vegas, and she made several visits to Frank at his Cal-Neva lodge in Lake Tahoe, an investment he later had to give up over charges of organized crime connections. After Marilyn’s divorce from author Arthur Miller, Frank gave Marilyn a small white poodle to replace the dog she lost in the divorce. Marilyn showed her sense of humor by naming the dog “Maf”, which was supposed to be short for Mafia. It’s not generally known what Frank’s reaction was to that, but it’s known that they remained friends until Marilyn’s untimely death in August of 1962. And it’s believed that Marilyn actually spent one of the last weekends of her life at Frank’s Cal-Neva lodge. Frank and Marilyn are remembered in tribute shows including the Las Vegas Frank Sinatra Impersonator production called Frank and Marilyn; The Tribute, featuring two performers who live in Los Angeles.